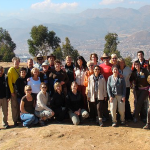 “Peru has given me a new perspective in life that I never experienced anywhere else. Your trip changed my life forever and no one will ever understand the depth of it. Dear Vera, it is hard to believe that we returned from Peru seven weeks ago. Nevertheless, I wanted to write a few lines to thank you for facilitating the most enchanting journey I have ever taken and share with you a little bit of my experience. Over the course of my life, I have been blessed with numerous opportunities to travel and see the world, but the journey to Peru was, by far, the BEST on many levels. The trip solidified my thoughts that I’m, we are not separate, but instead part of an unbroken wholeness that has existed for millions of years. The entire trip was an exalting and rewarding experience of the highest kind. So stunning, so beautiful, so worthy and grateful that it allowed me to open to another possibility, to another dimension. Unlike commercialized tours that charge exuberant fees or others that charge less, but don’t deliver and one gets very little in return, your Spirit of the Earth tour package afforded me an authentic experience in a country that is rapidly becoming very westernized. Instead of rushing us from tourist trap to tourist trap, your well-planned itinerary gave me endless days of pure ecstasy. Being able to experience Peru and understand the cultural and historical richness of this ancient land was extremely rewarding. The time spent in circles was worth my every breath. Our experience with the first shaman outside Cusco, Don Pedro, was illuminating and set the tone for the rest of the trip. His knowledge of Andean medicine or Despachos, and of human energy centers was formidable. My crown chakra has never been so open. I can still feel his hands on top of my head as he manipulated it. As a result, it continues to be fully active. The surprise ceremony that awaited us as we entered Machu Picchu for the first time was phenomenal. It made the first day at the sacred citadel unforgettable. Not even the Orient Express or National Geography guides would have orchestrated it better. You truly took the time to ensure that our hearts, minds and souls were aligned and ready to receive the blessings of Pachamama. You managed to create a sacred space around hundreds of tourists that enabled us to detach from the mundane and experience the divine. You were very wise in introducing us to the sacredness and grandeur of Machu Picchu the way you did. I can still hear the comments of other tourists as they passed us by or of those that stopped to inquire. Qucho, the Quechua shaman you work with in the Sacred Valley is truly an evolved light being. It was obvious to me that he is in contact with the ancestors of the land. His knowledge of astronomy and sacred Inca mysticism allowed me to journey and discover aspects of myself unknown to me. His understanding of sacred geometry highlighted every corner and colored every mountain within the sacred citadel. I will always be grateful for being able to connect to the eternal Divine Principal and aligned myself with the cosmic center in Machu Picchu and Mt. Putucusi. In these very short weeks since my arrival at home, I have realized that there is no joy equal to the joy of learning and working with the Divine spiritual wisdom at a sacred site. Now that I have tasted its sweetness, I realize that it is my birth right to walk this earth enjoying the sacred knowledge that many seek, but few take the time to experience. Today, I rejoice in abundance of joy, self-knowledge, intuition and endless richness of Spirit. And I want nothing else. This spiritual prosperity of body and mind, work and play that I am enjoying since my return is truly spectacular. I will always be grateful to you for facilitating this magnificent journey and look forward to traveling with you again. May your life be guided by greatness. May all of the gifts you so freely shared with me and the entire group grow and multiply. May they be the fertilization of infinite tomorrows.